GUWAHATI, May 9  A businessman and his son were shot dead by suspected ULFA militants, while a top leader of the insurgent outfit was killed in an encounter with the Army in Assam since last night, official sources said here today. NEW DELHI, May 9  Activists of the National Akali Dal today held a demonstration near the Pakistan High Commission to protest against the appointment of a former Inter Services Intelligence chief as the head of the Pakistan Gurdwara Parbandhak Committee. NEW DELHI, May 9  An opinion poll has predicted an uncertain verdict in the coming general election throwing up a hung Lok Sabha with the BJP and its allies winning 220 to 232 seats closely followed by the Congress and its partners with 191 to 203 seats. BANGALORE, May 9  As many as 43 buses belonging to Karnataka, Tamil Nadu and Andhra Pradesh State Road Transport Corporations were damaged and 25 persons, including drivers and conductors, injured when a 500-strong mob demanding the plying of more buses, threw stones at the main bus stand here early today. NEW DELHI, May 9  Mothers Day was celebrated by greeting and commending a cross-section of mothers in Delhi, Mumbai and Bangalore ranging from housewives to working mothers and even celebrities. CHENNAI, May 9  Ramar Pillai, who shot into fame by his product 'herbal petrol', was allegedly kidnapped and a ransom demanded for his release, the police said today. NEW DELHI, May 9 Rajya Sabha member D.P. Yadav, whose son Vikas is an accused in the Jessica Lal murder case, has sought two days time to appear before the police to assist the investigations. NEW DELHI, May 9  The process of elections to the 40-member Goa Legislative Assembly to be held on June 4 will commence tomorrow with the issue of a notification by the Governor on the recommendation of the election commission. BHUBANESWAR, May 9  The toll in the current heat wave in Orissa rose to 60 with four more deaths reported today, official sources said. NEW DELHI, May 9  The Justice Santosh Duggal Committee, formed by the Delhi High Court to ascertain whether the 40 per cent fee hike affected last year by public school managements was justified, is disgusted with the non-cooperative attitude of the Delhi Government. NEW DELHI, May 9  The Centre today announced the Technology Day awards for innovative meritorious inventions. NEW DELHI, May 9  Former Chief Justice of India A.M. Ahmadi today said the number of Muslims in legislatures had been declining over the years and blamed political parties for not giving the community due representation while selecting candidates for elections. Why Bangladesh war began on Dec 4? NEW DELHI, May 9  Field Marshal S.H.F.J. Manekshaw, the architect of Indias victory in the 1971 war against Pakistan, says that he chose December 4 for the launch of operations since it was my lucky number. NEW DELHI, May 9  The Communist Party of India today indicated that there was a possibility of forging a third alternative before the elections and it had not out ruled joining hands with the Rashtriya Janata Dal in Bihar and the Samajwadi Party in Uttar Pradesh to prevent a split in the anti-BJP votes. NEW DELHI, May 9  Sajjad Ali, a 30-year-old singing sensation from Pakistan has found his way into the Indian music market. Sajjads album "Sohni Lag Di" was informally launched here by a music company early this week. NEW DELHI, May 9  The toll in the current heat wave sweeping across the country has crossed the 200 mark, with 14 more deaths reported from Uttar Pradesh and Orissa in the past 24 hours. JAIPUR, May 9  Indubala Sukhadia, former MLA and widow of former Congress Chief Minister of Rajasthan Mohan Lal Sukhadia, died at Maharana Bhupal Hospital in Udaipur yesterday. NEW DELHI, May 9 Dual member constituencies having both a male and a female representation are the need of the hour if the women are to get around the circumvention of the womens reservation Bill by their male counterparts in Parliament, according to All-India Congress Committee Secretary Mani Shankar Aiyar. GUWAHATI, May 9 (PTI)  A businessman and his son were shot dead by suspected ULFA militants, while a top leader of the insurgent outfit was killed in an encounter with the Army in Assam since last night, official sources said here today. Suspected ULFA militants shot dead businessman Shafiuddin, popularly known as Shafi Bepari, and his son Saiful Islam in Assams Morigaon district last night apparently for failure to pay Rs 5 lakh ransom. The ultras fired on the victims from a car as they were closing their shop at Moirabari, killing them on the spot, two other persons standing nearby were injured in the incident. The ULFA had demanded Rs 5 lakh from the businessman which was not paid, the sources said. Meanwhile, self-styled Action Group Commander of ULFA, Jayati Deka was shot dead by troops of the Armys 21 Mountain Division today in an encounter at Barbila village in lower Assams Nalbari district. Acting on a tip-off, the army men carried out a search operation at Barbila on the eastern banks of the Pagladia river near Kalakuchi when they were fired upon by ULFA ultras hiding inside a house. The troops returned the fire, killing Deka on the spot, the sources added. NEW DELHI, May 9  Activists of the National Akali Dal (NAD) today held a demonstration near the Pakistan High Commission to protest against the appointment of a former Inter Services Intelligence (ISI) chief as the head of the Pakistan Gurdwara Parbandhak Committee (PGPC). The NAD President, Mr Paramjit Singh Pamma, said the appointment of a former ISI chief, Lt-Gen (retd) Javed Nasir, as the PGPC head was a clear indication of government interference in the functioning of the gurdwaras. He said this appointment was a double standard. On one hand the Pakistan Government was trying to reflect its friendliness and on the other hand it was trying to promote terrorism, Mr Pamma said. A note issued by the NAD stated that the appointment was an indicator that Pakistan was making efforts to revive terrorism in Punjab. NEW DELHI, May 9 (PTI)  An opinion poll has predicted an uncertain verdict in the coming general election throwing up a hung Lok Sabha with the BJP and its allies winning 220 to 232 seats closely followed by the Congress and its partners with 191 to 203 seats. The poll, commissioned by "India Today" magazine between April 30 and May 3, has shown that marginalisation of the third front which began in the 1998 elections has accelerated with their strength in the Lower House declining from 96 in the last elections to 57 to 63 in the September-October general election. It has forecast a distinct advantage to the BJP combine in the north having 152 seats as it indicates that the saffron grouping will corner 80 to 90 seats leaving the Congress and its allies way behind with 30 to 35. The poll, conducted by, ORG-MARG covering 16,123 registered voters in 66 Lok Sabha constituencies, has demonstrated a direct fight between the Congress and the BJP combines in the west having 118 seats with the former winning 60 to 65 while the latter securing 52 to 57. While it has predicted that the Congress and its partners would continue to dominate in the 130-seat southern region, the east would witness a neck and neck race between the two major groupings as also others including the third front. As many as 43 per cent of the respondents in the survey carried out after the dissolution of the 12th Lok Sabha felt that Atal Behari Vajpayee would be the best Prime Minister followed by 32 per cent favouring Congress president Sonia Gandhi. Only four per cent each of the respondents favoured Samajwadi Party leader Mulayam Singh Yadav and senior Marxist leader Jyoti Basu as the best Prime Minister while former Premier I.K. Gujral was supported by a mere two per cent. An interesting finding of the survey was that 44 per cent of the voters interviewed denied that Sonia Gandhi had less chance of becoming Prime Minister because she was not born in India, while 33 per cent said that her foreign origin could be a hurdle, six per cent were non-committal. The issue of rising prices turned out to be the most vital among the voters with 40 per cent being concerned about it followed by 24 per cent saying that they were worried over widespread unemployment. The plank of stability at the Centre and corruption in public life were voted by 11 per cent each as the other major election issue. The issues of law and order, national security and religion and caste-based problems elicited seven per cent, three per cent and four per cent response respectively. An overwhelming 80 per cent of the respondents favoured a single party rule followed by a mere 14 per cent for a coalition government. However, 42 per cent preferred a BJP-led coalition, 39 per cent a Congress-led one and 14 per cent supporting a Left/third front-led government. The survey made it clear the the poll reflected the mood at the time of the Lok Sabhas dissolution and is clouded by the perception of the events following the BJP-led governments one vote defeat. "It is essentially a status report of battle readiness, not the last word on the final outcome". An overwhelming 60 per cent of the respondents were of the view that Lok Sabha should not have been dissolved and the Vajpayee government should have served its full five years in office. As many as 59 per cent said that the pulling down of the Vajpayee government was not justified while 47 per cent felt that they were more sympathetic towards the government in the wake of the recent events. On Mr Vajpayees performance as Prime Minister, 49 per cent rated him as good, 27 per cent average and 15 per cent bad, 37 per cent termed as good the performance of the BJP-led government while 33 per cent felt it was average, 22 per cent described it was bad. Thirtyfive per cent of those surveyed felt that the Congress could provide the most stable government, followed by 33 per cent favouring the BJP and 22 per cent others. However, 35 per cent of the respondents were of the view that the BJP was best placed to solve Indias problems, closely followed by the Congress with 33 per cent and others including third front being favoured by 23 per cent. BANGALORE, May 9 (UNI)  As many as 43 buses belonging to Karnataka, Tamil Nadu and Andhra Pradesh State Road Transport Corporations were damaged and 25 persons, including drivers and conductors, injured when a 500-strong mob demanding the plying of more buses, threw stones at the main bus stand here early today. The Police said the mob also damaged computer equipment and television sets. Even as the officials on duty were trying to pacify the mob, some miscreants armed with iron rods, smashed the window panes of the buses, ransacked the office and robbed money from weighing machines. Forty persons were arrested in connection with the incident. The situation was now normal. NEW DELHI, May 9 (UNI)  Mothers Day was celebrated by greeting and commending a cross-section of mothers in Delhi, Mumbai and Bangalore ranging from housewives to working mothers and even celebrities. Aimed at recognising the tears and sweat that mothers go through to bring up their children and keep a happy home running, they were presented with flowers and cards. One of the oldest tea brands in the country sponsored a 10 seconds' TV commercial a Mothers Day special on a private TV channel. CHENNAI, May 9 (PTI)  Ramar Pillai, who shot into fame by his product 'herbal petrol', was allegedly kidnapped and a ransom demanded for his release, the police said today. Pillai had left his residence in suburban Valasaravakkam around 6 p.m. (11.30 GMT) on Saturday evening for a walk but did not return, police sources said. The police was informed about Mr Pillai's disappearance by anxious family members and relatives after frantic attempts to trace him failed as he was to board Tamil Nadu Express for Delhi on Saturday night. A friend of Mr Pillai had received an anonymous call, demanding a ransom of Rs 10 lakh for his release. Mr Pillai was to be accompanied by his wife and a sister to Delhi where he planned to meet Congress President Sonia Gandhi and the Prime Minister to seek financial help for his project. The police have launched a massive combing operation to trace Mr Pillai. NEW DELHI, May 9 (UNI)  The process of elections to the 40-member Goa Legislative Assembly to be held on June 4 will commence tomorrow with the issue of a notification by the Governor on the recommendation of the election commission. According to the schedule announced on May 5, nomination papers will be accepted by the returning officers till May 17. Scrutiny will be done the next day and the last date for the withdrawal of candidature is May 20. Counting of votes will be taken up on June 6 and the entire process is scheduled to be completed by June 10. The President's rule was imposed in the state on February 10 as no combination of political parties was in a position to form a government. The Centre and state government made it clear to the election commission that they had no intention to extend the President's rule beyond August 9. All political parties also advocated for early elections. Since the majority of the electorate in the state are educated and by and large have been exercising their franchise in a peaceful and orderly manner, the election commission has decided to use electronic voting machines on a large scale to avoid delay in the polling and counting of votes. Meanwhile, the model code of conduct for candidates and political parties has come into force in the state. BHUBANESWAR, May 9 (PTI)  The toll in the current heat wave in Orissa rose to 60 with four more deaths reported today, official sources said. Three deaths were reported from the coastal district of Jajpur, while one succumbed to the heat at Anugul since yesterday, the sources said. They said normal life was today virtually paralysed in the western belt of Orissa where the mercury shot to 45°C at several places. Bolangir town recorded 47.5°C followed by Sambalpur with 46.2°C. Temperature was also high in the coastal districts with Bhubaneswar recording 41.4°C and Cuttack 40.6 °C. Weatherman said many places in the state were likely to have rain or thundershowers during the next 24 hours. NEW DELHI, May 9 (UNI)  The Justice Santosh Duggal Committee, formed by the Delhi High Court to ascertain whether the 40 per cent fee hike affected last year by public school managements was justified, is disgusted with the non-cooperative attitude of the Delhi Government. Instead of filing a progress report, the committee has filed a report in the court on the acts of omission and commission of the government. The committee, finding itself virtually helpless to carry out the task assigned to it by the high court in the absence of staff, office, working facilities and relevant documents, has offered to resign. Although Justice Duggal, a former judge of the high court, had sent the report in a sealed cover directly to the Division Bench headed by acting Chief Justice Devinder Gupta, the court ordered that it should be put on record, making it a public document. In fact, throughout my long professional and service career, I have never felt so harried or stymied functionally as in the process of chairing this committee, she said in her hard-hitting five-page report, filed in the court recently. Although the court directive was for the constitution of the committee and the finalisation of all details within 10 days of the judgement, passed on October 30 last year, the Delhi Government appeared to be in no hurry to implement the order. The gazette notification was issued only on December 7. The committee was forced to operate from the residence of Justice Duggal in the absence of any office accommodation, she said, adding that the problems continued as the Secretary was not appointed, documents which were asked for were not provided and the government did not even respond to the repeated communications of the committee. The greatest casualty in the present instance had been the essential infrastructure which was the functional need of any set up in terms of manpower, equipment and other basic necessities, she said. Things came to such a pass due to the complete lack of action in every respect that I was compelled to inform the Chief Secretary of the Delhi Government that unless our requirements were met by March 31, 1999, we did not think it worthwhile to go on attending office after that, Justice Duggal informed the high court. Although the Chief Secretary has remained incommunicado, even thereafter, an office order appointing a secretary to the committee was issued on March 31, but no effort was made to ensure that he actually joins. Surprisingly, the grade II assistant who was looking after the office in the absence of a superintendent was suddenly withdrawn without any intimation to the committee, she said. On the Technology Day, which would be celebrated on May 11 as per the announcement of the Prime Minister, Mr Atal Behari Vajpayee last year, cash awards to the tune of Rs 3.80 lakh would be presented for seven inventions. The Prize Award Committee of the National Research Development Corporation on behalf of the Department of Scientific and Industrial Research has recognised developments and inventions in key areas such as chemical, mechanical and medical. Mr R.U. Kanitkar and Ms Sandeepa Inamdar Kanitkar of Pune have jointly been awarded a sum of Rs 1 lakh for the development of bio-innoculant in liquid form with plurality of strains used as a liquid fertiliser and bio-foliar sprays for the augmentation of crop yield. The liquid bio-fertiliser is not only cost effective but also has a longer shelf life as compared to solid bio-fertilisers. It is easy to apply and has been found to be highly effective for many crops. Dr R.V.K. Singh, Dr Salil Kumar Ghosh and Dr Bharat Bhushan Dhar of Central Minining Research Institute, Dhanbad, have been awarded jointly Rs 75,000 for the development of cheap and suitable fire protective coating materials for preventing spontaneous heating in open cast mines. Mr R.K. Syal, Mr S.B. Talegaonkar, Mr S.K. Saudi, Mr K.D. Borole and Mr J.R. Peshawe of High Energy Materials Research Lab, Pune have been awarded jointly Rs 75,000 for the development of combustible cartridge cases for tank-gun ammunition. Other inventions selected for the award include the development of a silkworm body and rearing seat disinfectant called Vijetha. This disinfectant which is used for rearing of silkworm is very effective in prevention of all silkworm diseases. The product has a shelf life of one year and is also environment friendly. A sum of Rs 35,000 has been awarded for the development of reducing the period of retting of coconut husks and upgrading the quality of unretted green husks coir fibre by treatment with bacterial cultures. The coirret bacterial formulation is used for extracting coir fibre from the coconut husk. The development of an interamedullary interlocking nail, a new design for joining fractures of tibia and development of pedal operated rice mill have also been given awards. NEW DELHI, May 9 (PTI)  Former Chief Justice of India A.M. Ahmadi today said the number of Muslims in legislatures had been declining over the years and blamed political parties for not giving the community due representation while selecting candidates for elections. The number of Muslim MPs has shrunk from 46 in 1980 to a very low of 28 in the 12th Lok Sabha, which is only 5.5 per cent as compared to 12.5 per cent Muslim population in the country, Justice Ahmadi said while inaugurating the national convention of the Movement for Empowerment of Muslim Indians. He said the decline was mainly due to the reluctance of national parties to field sufficient number of Muslim candidates and their unwillingness to transfer non-Muslim votes to Muslim candidates. He said the delimitation and selection of reserved seats was done in a way that led to under-representation to Muslims as the constituencies were reserved only in those areas where the community had a substantial presence. Without directly naming any party, the former CJI accused political parties of pursuing the divide and rule policy for narrow political gains. The communal divide has increased during the last decade creating a sense of insecurity among minorities, particularly Muslims and in recent times Christians too, he added. Justice Ahmadi said very few eminent Muslims who could contribute in the development of the country and the community were nominated by political parties to the Rajya Sabha. He also said Muslims were not given adequate representation in government and private sector jobs and educational institutions. Enrolment of Muslims in educational institutions is 62 per cent, which is 16 per cent lower than the majority community, he said, adding that Muslim representation in government service was just about two per cent. NEW DELHI, May 9 (PTI)  Field Marshal S.H.F.J. Manekshaw, the architect of Indias victory in the 1971 war against Pakistan, says that he chose December 4 for the launch of operations since it was my lucky number. Narrating anecdotes about the lead-up to the war at a function for the release of former Foreign Secretary J.N. Dixits book Liberation and beyond: India-Bangladesh relations, Field Marshal Manekshaw, the then Army chief, at his witty best, said this was the reason he gave to Prime Minister Indira Gandhi when asked why he had chosen that date. After he had told Indira Gandhi that the Army needed time to ensure a successful operation in East Pakistan, the Prime Minister would always ask me, Sam, when are you going to do it, Manekshaw recalled. Finally, I told her it would be December 4. Why the fourth, the Prime Minister asked. I said because it is my lucky number. I was born on a fourth, married on 22nd, which adds up to four. Had commanded 4 Corps, and when Krishna Menon (former Defence Minister) didnt like me he ordered an inquiry against me on a fourth, and I was exonerated on a 13th, the Field Marshal said amidst peals of laughter from the audience. NEW DELHI, May 9 (UNI)  Rajya Sabha member D.P. Yadav, whose son Vikas is an accused in the Jessica Lal murder case, has sought two days time to appear before the police to assist the investigations. In a letter to the Station House Officer of Mehrauli police station yesterday, Mr Yadav said despite receiving the notice requiring his presence before the police he was unable to spare his presence "due to prior political engagements yesterday and today". Expressing his readiness to assist the investigations, the Rajya Sabha member from Uttar Pradesh requested the SHO (Mehrauli) to grant him two more days time to present himself before the police. The police had issued the notice on May 7 under Sections 160 and, 175 of the Cr PC requiring Mr Yadavs presence before it for investigations into the killing of Jessica at Tamarind Court restaurant, owned by socialite Bina Ramani. In a press note Mr Yadav said reports that he was not cooperating with the investigating agencies were aimed at maligning his political image. Vikas Yadav is absconding since the murder of the model on April 30. NEW DELHI, May 9 (UNI)  The toll in the current heat wave sweeping across the country has crossed the 200 mark, with 14 more deaths reported from Uttar Pradesh and Orissa in the past 24 hours. In neighbouring Bihar, however, residents welcomed the thundershowers that helped bring the mercury down sharply. Temperatures fell by nearly 10 degrees at some places, leaving parts of the state relatively cool. The first rainfall of the season was recorded at 22.8 mm. On the flip side, strong winds with speeds of over 80 km per hour that lashed central Bihar early today, snapped power lines temporarily. Ten deaths were reported in Uttar Pradesh and Four in Orissa. With this Uttar Pradeshs toll reached 51 and Orissas 60. The weatherman has predicted that the heat wave condition is likely to persist in interior Orissa, while thunder squalls would occur over parts of northern Orissa in the next 24 hours. NEW DELHI, May 9  The Communist Party of India (Marxist) today indicated that there was a possibility of forging a third alternative before the elections and it had not out ruled joining hands with the Rashtriya Janata Dal (RJD) in Bihar and the Samajwadi Party (SP) in Uttar Pradesh to prevent a split in the anti-BJP votes. The CPM General Secretary, Mr Harkishan Singh Surjeet, told mediapersons here that in a bid to keep the BJP at bay, it might even consider supporting the Congress in states where other opposition parties were not formidable enough to defeat the BJP in the general election. He however, added that the party would oppose the Congress and project the need for a third alternative in states where the contest was between the Left parties and the Congress. NEW DELHI, May 9  Sajjad Ali, a 30-year-old singing sensation from Pakistan has found his way into the Indian music market. Sajjads album "Sohni Lag Di" was informally launched here by a music company early this week. "Sohni Lag Di is a collection of Hindi and Punjabi songs based on the theme of love, passion, desire and sacrifice. The title track "Sohni Lag Di" skilfully blends innovative music with emotional lyrics penned by Sajjad and his brother, Waqar Ali. While "Chief Saab" is memorable for its beats, "Chal Joothi" and "Mood Nahin Hai" attract the attention of listeners with the lyrics and Sajjads lively voice. "Mahiwal" and "Chal Udh Ja" are slow and have a soothing effect. Most of Sajjads lyrics are written by him or his brother. Sajjad is known for his own music compositions and video direction for his video clips. Born in Lahore, Sajjad Ali belongs to the legendary family of Ustad Bade Ghulam Ali Khan and Ustad Barkat Ali Khan. Initially, he focussed on folk music, but after 1992, he switched over to pop music. Based in Karachi for over a decade now, Sajjad has the distinction of performing at the annual Harballabh mela which is attended by top performers from India and Pakistan. Sajjad has over 25 albums to his credit and his maiden pop album "Babia", was released in 1992. His subsequent albums "Chief Saab", "Moody" and "Ek Aur Love Story" drew an overwhelming response. 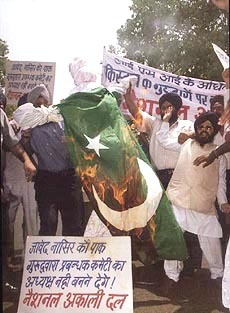 "Sohni Lag Di" was released in Pakistan and India simultaneously. Sources in the music company which released the album said that Sajjad expressed his inability to come as his film "Ek Aur Love Story" was scheduled for release in Pakistan towards the end of this month. The sources said the company had already put out stocks in the market and had three channels of distributing the album. JAIPUR, May 9 (PTI)  Indubala Sukhadia, former MLA and widow of former Congress Chief Minister of Rajasthan Mohan Lal Sukhadia, died at Maharana Bhupal Hospital in Udaipur yesterday. Indubala Sukhadia, (73), who was suffering from bronchitis for quite some time, had a cardiac arrest in the hospital soon after she was taken there for treatment. She was cremated this morning with full honours. A large number of people, including state Chief Minister Ashok Gehlot and several of his cabinet colleagues, paid their last respect to the departed soul. NEW DELHI, May 9 (UNI)  Dual member constituencies having both a male and a female representation are the need of the hour if the women are to get around the circumvention of the womens reservation Bill by their male counterparts in Parliament, according to All-India Congress Committee Secretary Mani Shankar Aiyar. Mooting this at a two-day workshop on developing womens leadership for nation building and effective governance which concluded here yesterday, Mr Aiyar said women have to consider other options if they do not want to lose out on the gains made by the struggle for greater representation in the Lok Sabha and assemblies. "It is an alternate solution to the legislation seeking one-third reservation for women in the event that Ms Geeta Mukherjees formula does not see the light of the day", he said in a reference to the persistent stalling of the passage of the Bill by the male members of Parliament. Under the proposed formula, each constituency could elect both a male and a female candidate to the lower house, doubling the strength of Parliament from the present 542 to 1084 seats. Thus there would be 50 per cent representation of women against the 33 per cent recommended by the Geeta Mukherjee Committee. He, however, hastened to add that the proposal was not aimed at sabotaging the womens reservation Bill. Instead, it would help the country to overcome the disadvantage of being the least represented democracy and yet the largest democracy in the world. The huge gap that existed between the electorate and the representative would be narrowed as even the most conscientious MP cannot serve a million people . MPs may not take to the idea but voters will benefit as they can then be represented by two MPs instead of one, Mr Aiyar pointed out, adding that in comparison to countries like China which had huge legislative bodies, Indian parliament was quite unrepresentative. Mr Aiyar said his plea to consider alternative solutions to the problem bedevilling the issue of women representation was based on the impressive performance of women representatives particularly in the so-called BIMARU states and in tribal areas. Former Union Minister Girija Vyas of the Congress said Gandhiji had assured the women of equality in independent India but things had not exactly worked out like that. Part of the problem lay in the unavailability of women candidates. "We never did the spadework about where the women would emerge from. Would they be from the grassroots or would a committee sift out the suitable candidates?" she said and admitted that she was the only woman office-bearer in the partys Rajasthan unit, the rest were all men. Participants at the workshop also considered the questions whether it was possible to have womens empowerment through the process of constitutional amendment alone, or whether it could also be done voluntarily by political parties.